Do you know what the most important nutrient the body needs is? The nutrient that is necessary for all living things to survive? Well, you may have guessed it – the vital nutrient that all living things require is water. An animal can lose almost all of their body fat and more than half of their protein but a loss of just 10% of their body’s water will result in the death of the animal. Water is essential for regulating many different body functions such as body temperature, hydrolysis the splitting of large molecules into smaller molecules, which aid in digestion and the elimination of waste from the kidneys. As you can see, maintaining a proper balance of water in the body is vitally important for all animals, human and canine alike! Many new raw diet feeders or BARFers who are aware of the importance that water has in their pet’s daily diet will express their concerns to me when they notice their dog will begin to consume a whole lot less water. Fortunately, there is a very easy-to-understand reason for this difference. You see, these new BARFers are used to their dog consuming A LOT of water when eating a cooked, dry dog food diet and after they switch their beloved pet to a water-rich, raw meat diet (BARF), the dog’s requirements for additional water is significantly reduced. That is because dry dog food diets only have a moisture content of about 10% while a BARF diet will contain an average of 70% moisture content. So a BARF fed dog will get the majority of his daily water intake from the diet instead of an external water supply, like his water bowl. The wonderful thing about your pet getting his water from the food rather than the bowl is that his body can utilize the moisture coming from the food much more effectively. Our pets are naturally designed to obtain their primary source of water from their meals. This is an important difference and becomes just another reason why feeding a raw food diet makes total sense. Of course, our pets still need an external water source to ensure that the proper moisture requirements of the body are met. It is equally important to use distilled water (instead of tap water) to provide the external moisture requirement for your companion animals. 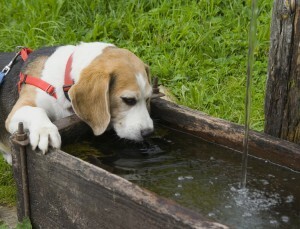 A chlorinated water supply creates a toxic environment for the dog that is best to be avoided if possible. It is little wonder why so many dogs are suffering from allergies and skin reactions today. The food our pets eat and the water they drink can be precursors to bad health! So let the food be your dog’s water source and supplement with distilled water in his bowl and watch your dog’s health begin improve dramatically. Robert Mueller, BSc, Pharm. is a registered pharmacist, author of “Living Enzymes: The World’s Best Kept Pet Food Secret”, and co-developer of BARF World’s BARF diets patties, nuggets and supplements – the first company to make the Biologically Appropriate Raw Foods (BARF) diet conveniently available to animals everywhere. He and his wife love to travel around the world with their dog, Moxie – a Yorkshire Terrier/Maltese mix. For more articles like these and to learn more about the benefits of raw food for your pets, sign up for “The Intelligent Pet” monthly e-zine at www.barfworld.com.